LAKE BUENA VISTA, Fla. (AP) — Backing off the harsh rhetoric of the Republican primaries, Mitt Romney pledged Thursday to address illegal immigration "in a civil but resolute manner." He outlined plans to overhaul the green card system for immigrants with families, and end immigration caps for their spouses and minor children. In a speech before Hispanic leaders, Romney made only passing mention of his promise to complete a 2,000-mile border fence to help stem illegal immigration. Instead he attacked President Barack Obama's new plan to ease deportation rules for some illegal immigrants brought to the United States as children as little more than a "stop-gap measure." "As President, I won't settle for a stop-gap measure. I will work with Republicans and Democrats to find a long-term solution," Romney told the National Association of Latino Elected and Appointed Officials. "I will prioritize measures that strengthen legal immigration and make it easier. And I will address the problem of illegal immigration in a civil but resolute manner. We may not always agree, but when I make a promise to you, I will keep it." Obama will speak to the same group Friday. The speeches come as the Supreme Court prepares to render judgment on a get-tough Arizona law and after Obama announced his new deportation plan. Romney again refused to say whether he would reverse Obama's policy, promising his "own long-term solution that will replace and supersede the president's temporary measure." The former Massachusetts governor has struggled in recent days to clarify his immigration policy as he pivots from the sharp tone that defined the months-long GOP primary to a general election audience in which Latinos will play a critical role. During the primaries, Romney and his Republican opponents focused on border security and English as the official language, but the former Massachusetts governor didn't spell out precisely what he would do to address the nation's immigration problem. On Thursday, as he filled in a few blanks, Romney devoted only one sentence in a 17-minute speech to the border fence and ignored language issues altogether. He did note, however, his father's birth to American parents living in a Mormon colony in Mexico. 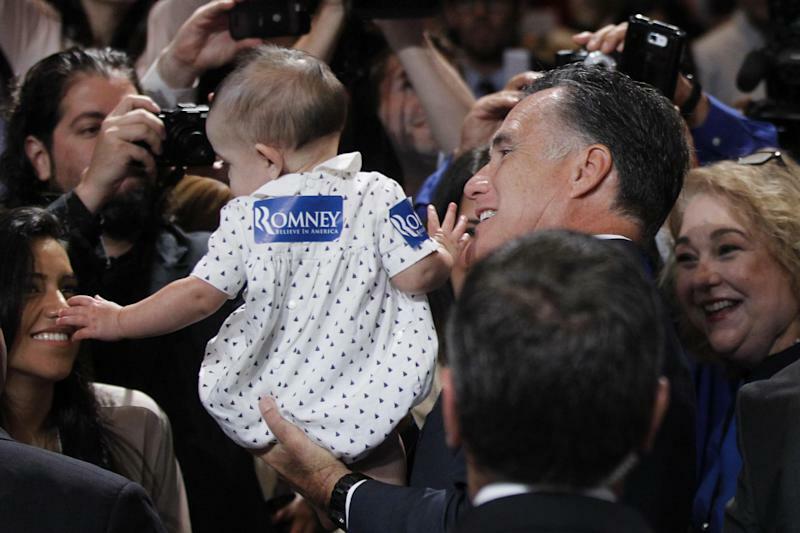 "When he was five, they left everything behind, and started over in the United States," Romney said. "I've spoken often about how proud I am of my father." At least 1 in 6 Americans is of Hispanic descent, according to the Census Bureau, and many lean towards the Democrats. By softening his tone on immigration, Romney is looking to narrow the advantage that Obama has with this pivotal constituency. The stakes are high not only for states with larger Hispanic populations such as Florida, Nevada and Colorado, but for a growing number of other battlegrounds — Ohio, North Carolina and Virginia, among them — where even a modest shift among Latino voters could be significant. Romney was vague in some areas — particularly the treatment of immigrant children brought to the country illegally by their parents — but offered new details in others. His plan to reallocate green cards for immigrants with families and end caps for spouses and minor children would mark a change from the current system, which is something of a first come, first served system. And his pledge to "staple a green card to your diploma" for immigrants who earned advanced degrees in the United States represents a significant change from current law. It is unclear how many of Romney's promises on immigration reform — such as granting green cards to high-tech graduates — could be accomplished without congressional action. Obama has used presidential authority twice since 2011 to make changes to immigration enforcement, including last week's announcement that many young illegal immigrants brought to the United States as children would be exempted for deportation and granted work permits good for two years. The president's re-election campaign blasted Romney for ignoring his previously stated opposition to the DREAM Act, a measure that would have allowed some children of illegal immigrants to stay in the country legally. "In front of an audience of Republican primary voters, he called the DREAM Act a 'handout' and promised to veto it," said Obama spokesman Lis Smith. 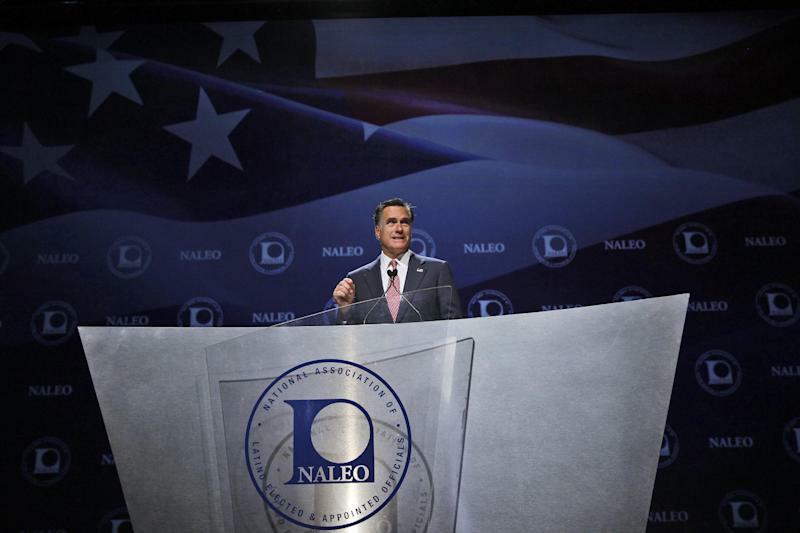 It was clear that Romney was on unfriendly turf as he addressed several hundred Hispanic leaders in a Disney World ballroom, particularly when the Republican candidate went after the president's health care overhaul. "If jobs are your priority, you've got to get rid of ObamaCare," Romney said, offering a line that typically prompts cheers at his rallies. But among the Hispanic crowd Thursday, only a handful applauded. At least one person booed. Obama is riding a wave of Latino enthusiasm over his decision to allow hundreds of thousands of illegal immigrants to stay in the country and work. Under the administration plan, illegal immigrants can avoid deportation if they can prove they were brought to the United States before they turned 16 and are younger than 30, have been in the country for at least five continuous years, have no criminal history, and graduated from a U.S. high school or earned a GED or served in the military. The new policy could help anywhere from 800,000 young immigrants, the administration's estimate, to 1.4 million, the Pew Hispanic Center's estimate. 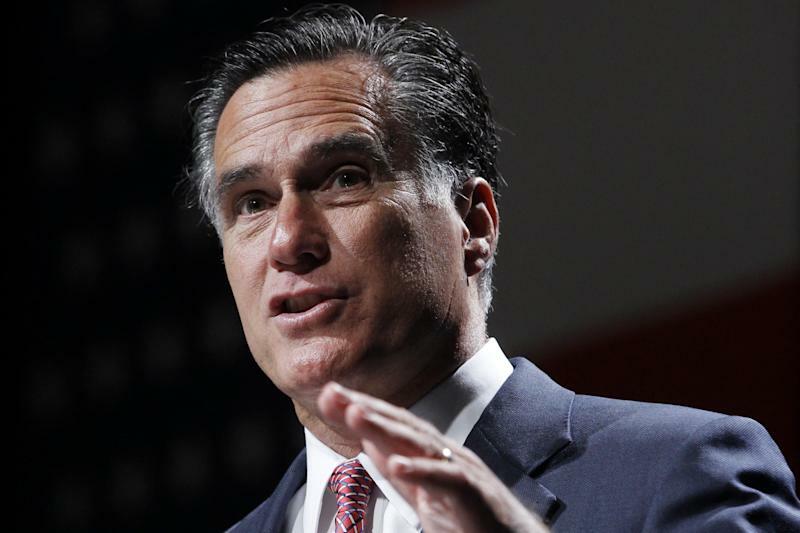 Romney seized on the temporary status of Obama's plan as his prime criticism. The Republican also vowed to offer illegal immigrants who serve in the military "a path to legal status" — which the campaign says could ultimately allow for full citizenship. But Romney's campaign could not immediately detail how many immigrants might be affected by his policies. Nor could they detail which would require legislative action. Romney highlighted what he calls the president's "broken promises" to deliver comprehensive immigration reform during his first term. "Despite his promises, President Obama has failed to address immigration reform," Romney said. "For two years, this president had huge majorities in the House and Senate — he was free to pursue any policy he pleased. But he did nothing to advance a permanent fix for our broken immigration system. Nothing. Instead, he failed to act until facing a tough re-election and trying to secure your vote." Both sides are crafting aggressive strategies to appeal to a demographic that is by no means monolithic but has supported Democrats in recent elections. Some Republicans fear — and Democrats hope — that Obama could capitalize on this moment to help solidify Hispanic voters as predominantly Democratic this fall and for years to come, much as President Lyndon Johnson hardened the black vote for Democrats as he pushed the Civil Rights Act of 1964. As is typical, Romney also focused on the economy. The former Massachusetts governor argued that his economic credentials would benefit all people who have struggled under Obama's leadership in recent years — women, younger voters and Hispanics among them. In his speech, Romney said that Obama is taking the Hispanic vote for granted. "I've come here today with a very simple message: You do have an alternative. Your vote should be respected, and your voice is more important now than ever before," he said. Oscar Garza, a Democrat from the border town of Mission, Texas, said he still needs to learn more about Romney's policies, but that he's been frustrated with Obama. He said that Romney's vice presidential selection could be a game changer for Hispanics. "A Marco Rubio would potentially swing my vote," he said. AP's Alicia Caldwell in Washington contributed to this report.